The astrological sign of Taurus, a semi-circle above a circle, symbolises the moon through which the energies are received from higher circles and passed on to the earth. Taurus is called ‘Vrishabha’ in Sanskrit meaning the downpour of light. The star Aldebaran, which is called ‘Rohini’ in Vedic wisdom, is understood as the eye of the bull through which the energies are transmitted. When the sun passes through the constellation Rohini (between 11 and 24 degrees of Taurus), he is called the impregnating bull which impregnates the life on earth. It is also a spiritual impregnation which can give us a fresh dose of energy for acts of good will. 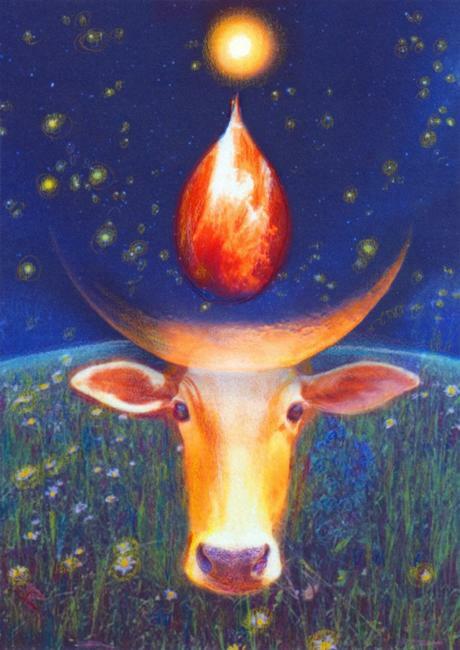 To illustrate this symbolism, I merged the image of the head of an Indian cow with the image of the crescent moon. I edited a photo of Aldebaran and placed it at the top as the sun from which a fiery drop comes down into the bowl formed by the horns of the cow. The earth indicated with a flower meadow shows the fullness of the freshly impregnated life. See more pictures on the site with my paintings. If you want to print the image, you can download the file in medium and high resolution format. The different zodiacal signs are clustered in groups – you can see here all my Taurus paintings.